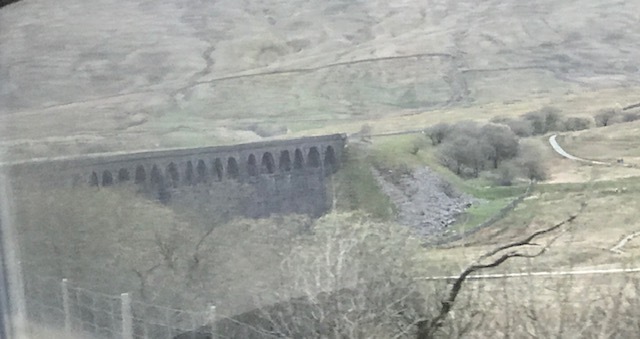 Pam runs workshops beside the Carlisle Settle Railway line. She can be contacted by email [pamelabolton@hotmail.co.uk]. Here’s a pic from the venue! 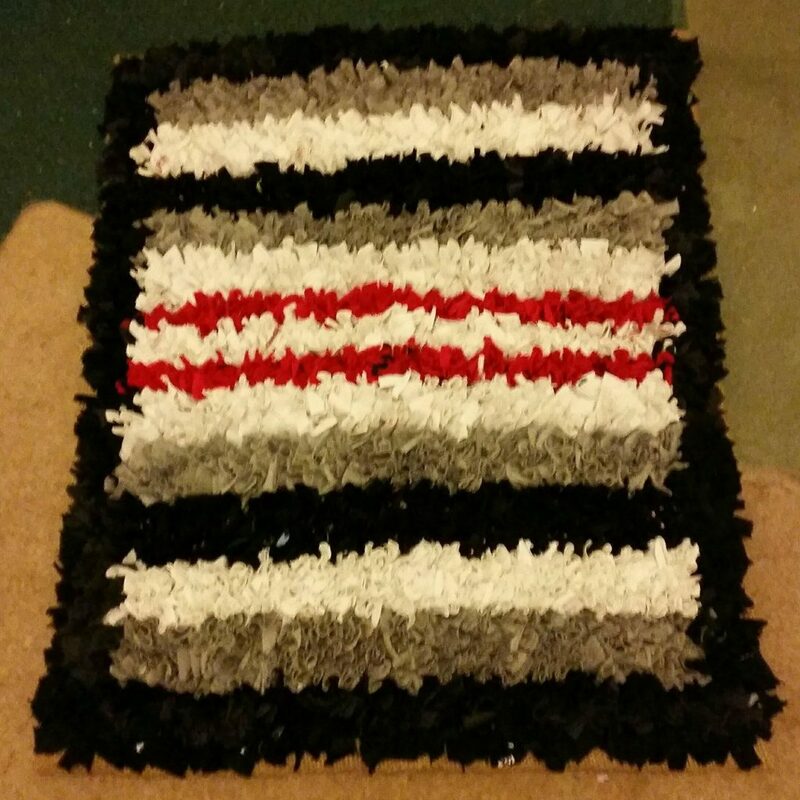 We’ve also updated our rag rug making hook & spider page to include new instructions. Thanks very much to Sheena Groom who visited the rag rug making stand at Manchester’s Event City and, later, sent this photo and comment. Hello, I was chatting to you on the stand on Thursday at event city. I was talking about the cute doggy piccys. I’ve bought a kit at previous show n just finished a small rug for my cats bed. You’d said to send a piccy, so ere it is! Lol, not big but I’m pleased with it. The tools are great and easy to use. Somebody has to say it…That rug looks purrrfect for a cat’s bed! Also still haven’t added the new 12oz hessian [to go with our new 6mm fine hook for rag rug making on a finer scale] to our shop. Sorry – it’s that time of year when everything in the rag rug making world gets very busy [no complaints on that score, though!]. In the meantime we can still take orders for it by phone [07796112366 or 01566 779136]. Hooray! At last we’ve just got our new 6mm rug hooks listed for rag rug making on a finer scale – the existing, 8mm, ones are very popular, we’re very glad to be able to say, but a number of people have asked for a smaller size. Now, after much setting up and testing, the first lot are available and are the same price as our standard ones. 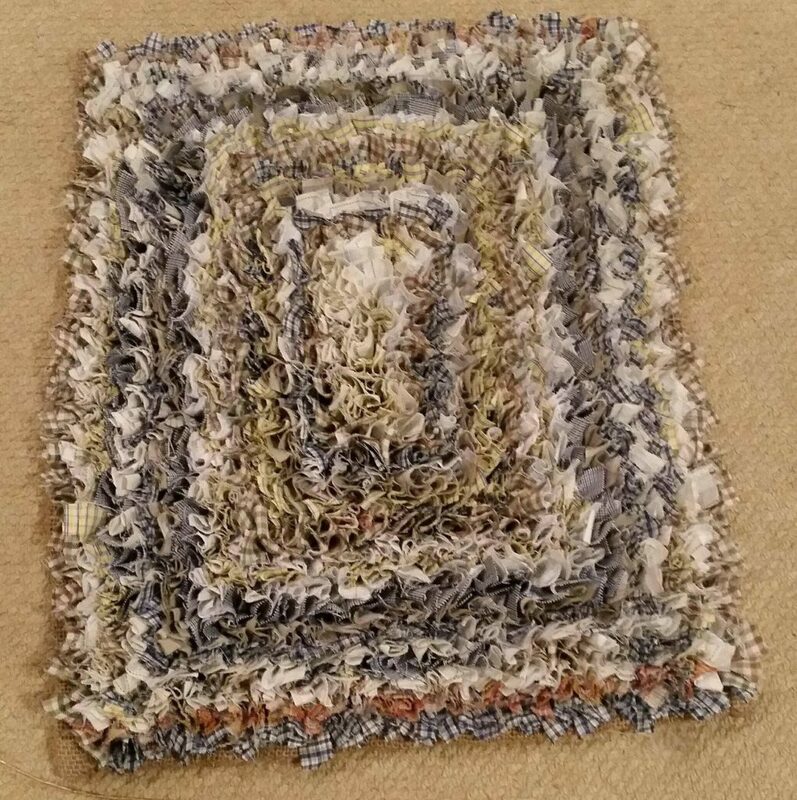 Thanks very much for all the nice comments about this rag rug making video, How to make a rag rug, we’re very glad it’s so popular! 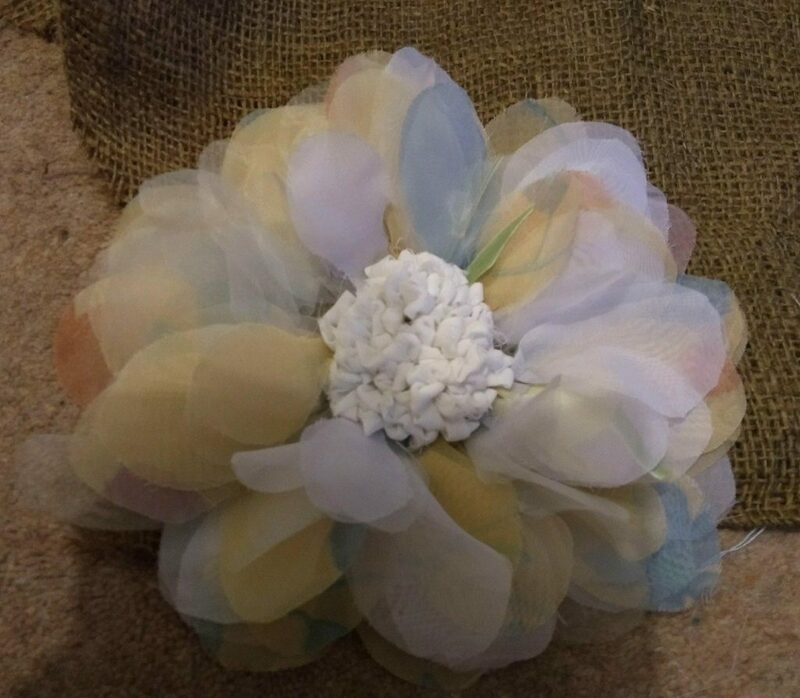 Here are a few more links to demonstration videos: How to make a rag rug || How to use the spider tool || How to use the cutting gauge || How to hem your rag rug || How to make a rag rug using plastic carrier bags || Using the Pinking scissors gauge ||How to make a Christmas Wreath using a rag rug tool. We’ve been making the tools for traditional rag rug making, that’s the rag rugs that used to be so popular in Britain, Australia & New Zealand since 1990. We usually post all orders the same, or next, working day. 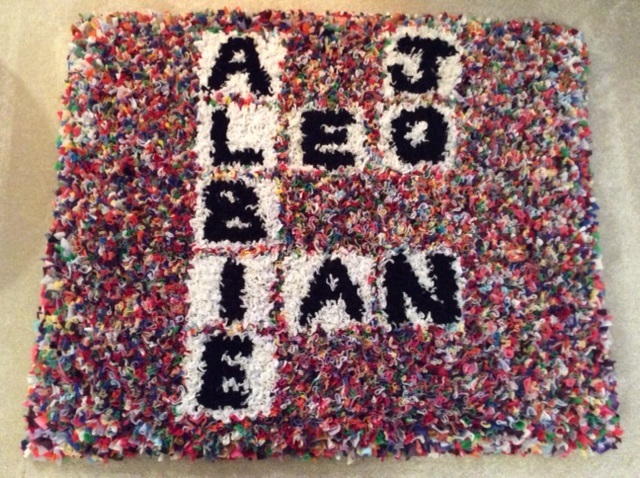 Janet White sent us a pic of her latest rug. Clever stuff and a beautiful rug. Her take on tile art. 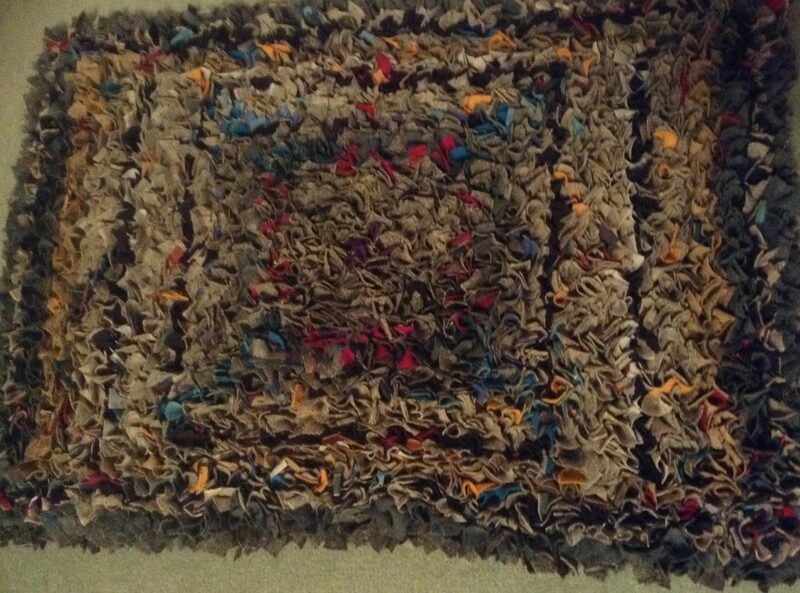 Looks like Janet’s made rag rug making mightier than the pen! 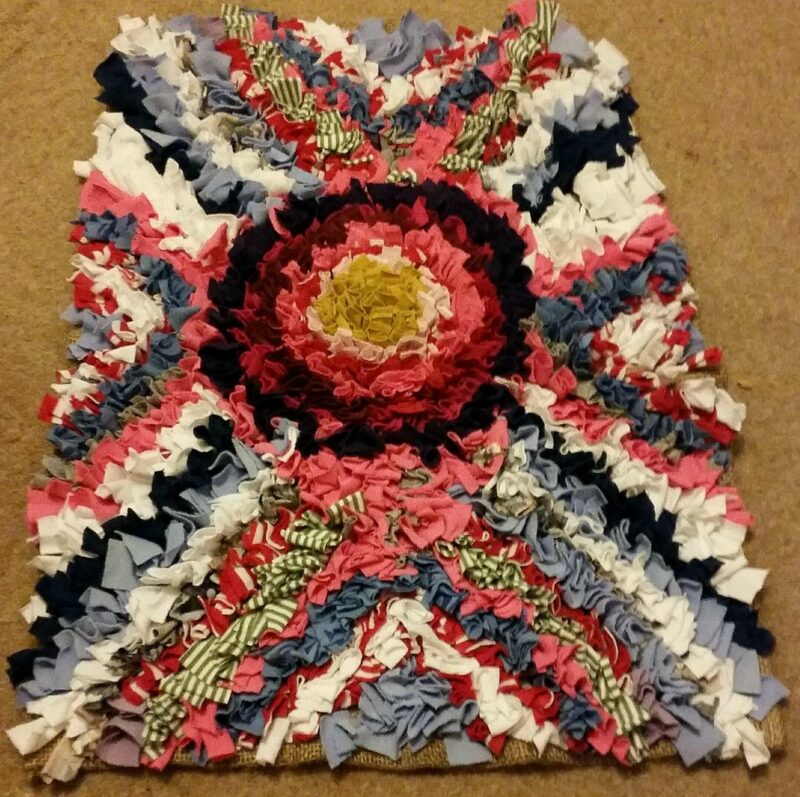 Latest pic from Ruth Bartholomew just goes to show rag rug making doesn’t have to be for something to stand on, it can be 3D art! 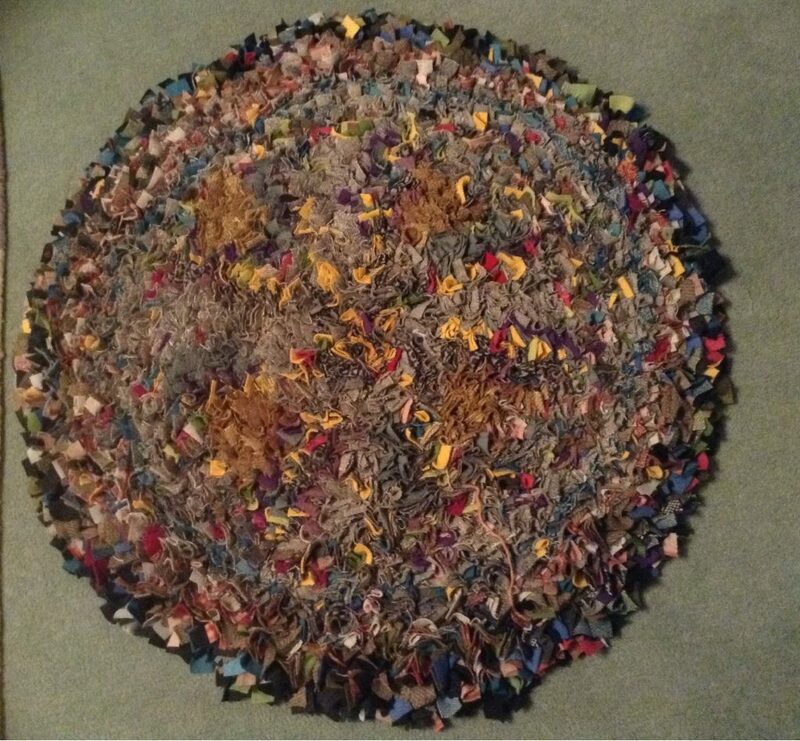 Ruth Bartholomew kindly sent us these pics of 3 rugs she’s made. Ruth says she cut old garments into long strips for crocheting and uses small pieces for making rag rugs. We like that – nothing goes to waste! 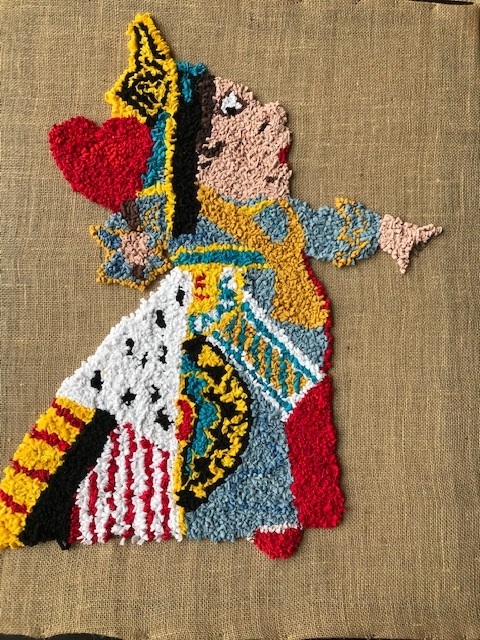 It’s amazing what a bit of rug hooking can do! Bag decorated by Jude, in Gwynedd. 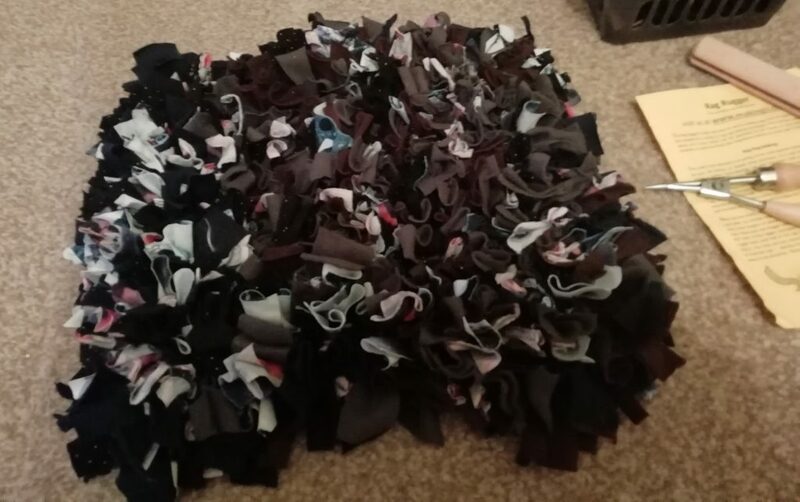 Rag rugs, rag rugging, rag mats, clippy, spring clip, clootie, proddy, proggy, bodged, peg, pegged – call ’em what you like, this site is all about the old favourite ‘hard times’ rag rugs and how to make them. We make a range of rag rug tools to our design including our rag rugger [as used by Kirstie Allsopp on her craft series a little while back], cutting gauge, hook and more. 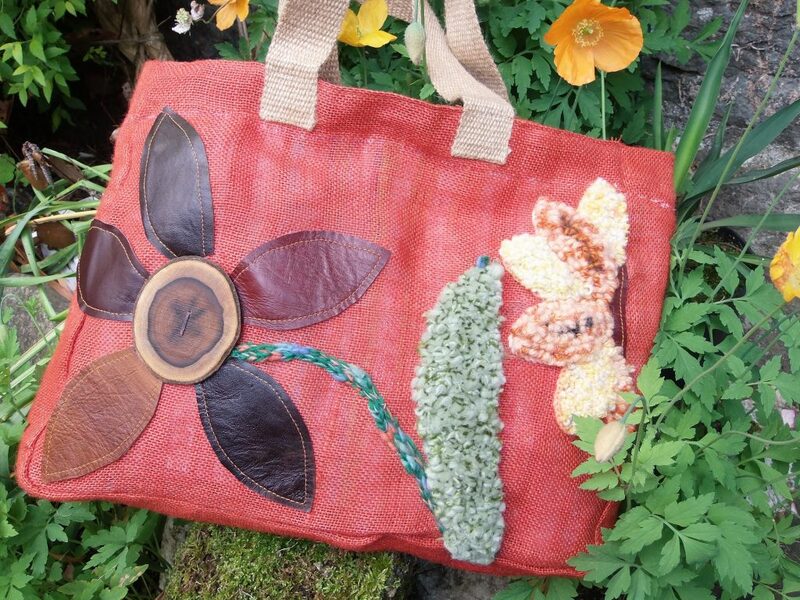 We can also offer expert advice on virtually all aspects of rag rug making. 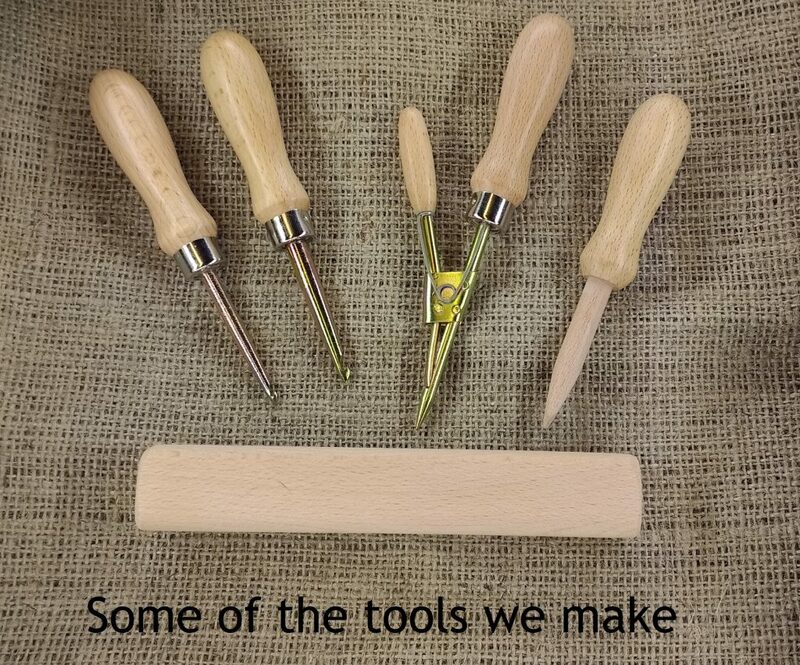 We’ve made all the tools ourselves for over 25 years when we revived the traditional UK ‘hard times’ craft by redesigning the Victorian tool for the modern age, it still works in exactly the same way though. Please visit our Facebook page and add your comments, questions, likes and images of your own rugs. We are also on Twitter.